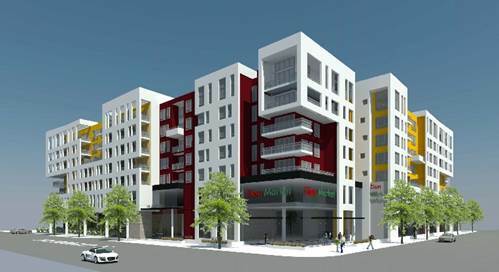 Rescore Property Corp has obtained $153.75 mil in construction financing for Rise Koreatown, a seven-story, Class A multifamily property located just off Wilshire Blvd in Los Angeles. The loan was arranged by Walker & Dunlop Inc.
Rise Koreatown will comprise 364 luxury studio and one-bedroom apartments averaging 649 sf, catering directly to the young professional demographic who desires a luxury product in a highly walkable urban location. The property will also feature 52k sf of ground floor retail anchored by Zion Market, a Korean grocery chain. The project is one of many new developments in the Koreatown area, which is currently experiencing an unprecedented amount of investment activity. In addition to this multifamily offering, several office, retail, and hotel deliveries are scheduled for the coming years. The neighborhood’s rise in popularity is thanks to its centralized location near downtown, proximity to multiple metro stops, and access to trendy restaurants, businesses, and a forthcoming museum. Walker & Dunlop’s Kevin O’Grady and Eric McGlynn led the team that arranged the senior and mezzanine financing for the project. Based in Boca Raton, FL, Rescore Property Corp is a private real estate investment trust founded by Arthur Falcone, Tony Avila, and Bill Powers. Their local development partner is Los Angeles-based Cal-Coast.